He may have been born in Ohio and died in Texas, but Frederick Funston is forever linked to his boyhood home in Kansas. It is there in the southeast corner of the state that his boyhood home has been restored as a museum in the once-bustling county seat of Iola. Funston, like legions of Kansans before him, knew that a deep appreciation for their state can best be developed by visiting less fortunate places - and then returning. Before his life was over (at the age of only 51) Funston made a tour of such places - each one seemingly less fortunate than the one before. Arkansas, The Dakota Badlands, Death Valley, the Yukon, Cuba, The Philippines, Mexico, and Texas. After high school, Funston spent a year at Kansas State University and then dropped out to work. He worked for the railroad as a conductor and surveyor, several newspapers and any other jobs that might provide a bit of adventure. In the late 1880s, he took his first job that would take him out of Kansas (unless you count a brief newspaper job at Fort Smith, Arkansas). The position was that of a botanist for the U.S. Department of Agriculture. First visiting the Dakota Badlands and studying the flora there, he then went on assignment to Death Valley (to study dry flora) and then Alaska (to study frozen flora). After deciding he liked adventure - Funston saw the opportunity for more of it (with better pay) as an Army officer. While his height of five feet, four hadn't been an issue in civilian adventures, when it came to entering West Point - it suddenly became one. In order to demonstrate his sincere desire to become a soldier, Funston looked around for a suitable waiver. He enlisted as an "expedicionario" and fought alongside Cuban insurgents who were fighting Spanish rule. In Cuba, Funston participated in 22 battles and won the respect and admiration of his Cuban hosts. It's not easy for a Bantam-weight Americano to impress his Cuban hosts, but after being shot through both lungs - and having (no fewer than 17) horses shot from under him, everyone was impressed - even the bureaucrats back home. The height requirements were waived and Frederick became a U.S. Army officer. For America, one of the costs of winning the Spanish American War was governing both Cuba and the Philippines and not everyone, it seemed, appreciated U.S. liberation. Many of the Filipinos (as they were then spelled) rebelled against what they saw as "American Imperialism." 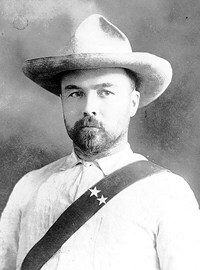 Funston was assigned to the all-volunteer 20th Kansas Infantry Regiment - a unit that was then training at the Presidio in San Francisco awaiting deployment in the Philippines. Called the "Kansas scarecrows" because of their loosely tailored, ragtag uniforms, the 20th Kansas was "adopted" by San Franciscans who would come visit them on weekends, watch their parades, bring them cookies and tease them about their uniforms. On one of these cookie-dispensing missions, Funston met Miss Edna Blankart. History of their brief courtship is hard to come by. Maybe it was charm and maybe she put raisins in her cookies, but whatever the reason, Funston was smitten. Frederick the Impatient proposed marriage on sight. Two days later Miss Edna was Mrs. Funston. Whatever honeymoon was available to the couple was cut short when the 20th Kansas was given orders for Manilla - just two weeks after the wedding. Under Funston's command in the Philippines, the 20th gained distinction and fame. With the same enthusiasm he exhibited in Cuba, Funston led his troops in 19 separate battles in its first year. The former "scarecrows" earned the nickname "The Fighting Twentieth." Back in those distant days - leaders were expected to lead and Funston led. In the battle of Calumpit, Funston and his men crossed a 400 foot-wide river under heavy enemy fire and tied off ropes to establish a ferry. Funston returned to be on the first raft across and his actions earned him a Congressional Medal of Honor. Funston was promoted to Brigadier General and he and the 20th returned to the United States as national heroes. While other officers would be content with resting on their laurels, Funston returned to the Philippines to lead a covert operation to beat the insurgents at their own game. With the help of 90 loyal Filipinos who impersonated rebel "captors," Funston and a few hand-picked soldiers pretended to be POWs who were "marched" directly into the headquarters of the President (and rebel leader) Emilio Aquinaldo. The capture was such a complete surprise that Aquinaldo had to be convinced that he had indeed become a prisoner. After returning to the U.S. and using his bully pulpit as a national hero, Funston embarked on a speaking tour chastising those opposed to a Philippine occupation and "American Imperialism." Frederick was perhaps a little too enthusiastic, so President Roosevelt suggested that perhaps the General might be assigned back to active duty. His speaking tour was short-circuited. "The man who saved San Francisco"
After resuming military duties, Funston was made second-in-command of the Army's Department of California back at the Presidio. While the first-in-command was away attending his daughter's wedding, Funston was in charge. On April 18, 1906, Funston found himself faced with challenges that made his previous adventures seem like so many picnics. The San Francisco Earthquake jolted Funston (and everyone else in California) awake shortly after 5 a.m. Downtown San Francisco was destroyed and 300,000 people were suddenly homeless. Funston immediately took charge and assembled his troops - marching them to downtown San Francisco and declaring martial law. He gave the order that looters would be shot on sight. The mayor of San Francisco was a musician with a corrupt reputation - but he was wise enough to work with Funston and not against him. Instead of fighting a turf war, Funston simply started giving orders. He dynamited buildings to create firebreaks (although this was later determined to be of dubious help). He acted without any state or national approval although technically only the President of the United States could order the U.S. Army to occupy a city. But through his immediate actions, communications were soon reestablished, emergency medical facilities were set in place and arrangements were made for housing the homeless populace. He was thereafter gratefully remembered as "The man who saved San Francisco." If it had been an election year - the man might've been elected governor by a (literal as well as figurative) landslide. Running with a campaign slogan of "Are we having Funston, Yet?" he was a shoe-in. But It wasn't only Funston that responded to the disaster, San Francisco's otherwise corrupt mayor redeemed his tarnished reputation and no one was removed from the scene for being incompetent (excluding a few looters who were dispatched into the next world). Actor John Barrymore who had been performing the night before actually sobered up (temporarily) and not one of the people in charge declared that they looked forward to returning home to shower, drink margaritas and eat Mexican food. Considering the limited communications available at the time - within hours of the earthquake, a relief train was sent into the city by the California governor - arriving just 18 hours after the disaster. A boat was immediately sent to Oakland to telegraph Washington and additional troop trains were en route within hours. Every square foot of canvas tenting that the army owned was shipped to San Francisco to provide temporary housing. A detailed account of the San Francisco earthquake (which would serve as a good comparison to Hurricane Katrina and the response to that disaster) is available in A Crack in the Edge of the World" by Simon Winchester, October, 2005. 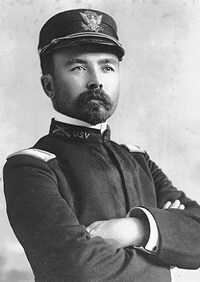 Funston later became commander of the Department of Luzon in the Philippines and in 1914, he occupied the port of Vera Cruz, Mexico, being appointed military governor there during the revolution du jour. (aka The Huerta Dictatorship.) Promoted to Major General, two years later during the "Punitive Expedition" against Pancho Villa, General Pershing may have gotten the press, but General Funston was the man Pershing answered to. In 1917, while stationed at Fort Sam Houston, Major General Frederick Funston died of a heart attack while dining at the Saint Anthony Hotel. At only fifty-one years of age, it would safe to assume Funston would've played a major role in the First World War had he lived. A short list of Funston's subordinates included future generals MacArthur, Patton and Eisenhower. It is widely speculated that Funston would've run for president against Harding, had he lived. General Funston was the first person to lay in state at the Alamo and his body was then sent to San Francisco where he was the first person to lie in state in the city hall rotunda there. Every person in San Francisco stood silent for two minutes in his honor. His grave is there at the Presidio cemetery - not far from the city he managed during its worst crisis. On the west side of the Allen County courthouse square.